Eric Sogard walked four times while batting in the 9th position in the lineup on Saturday night. How rare is it for a batter in the 9th position in the lineup to walk four times? Since 1914, it has only happened 14 times including Sogard this past weekend. He’s the first member of the Oakland Athletics to ever do it. Only two other players since 1914 have accomplished this and also stolen a base in the same game: Desi Relaford (2002) & Brady Anderson (1990). 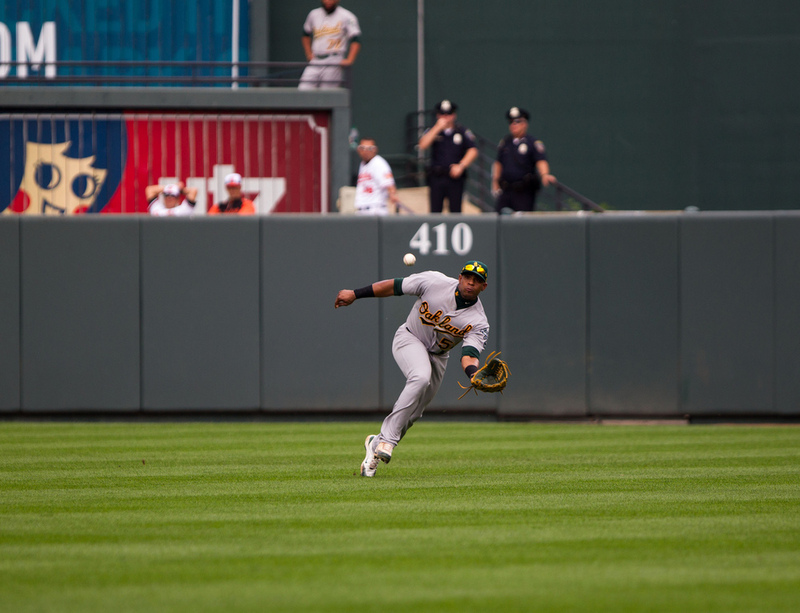 On top of all of that, Sogard also made an error – because in a game when weird things are happening to a defensive second baseman, of course he did. He’s now the only player in baseball history to have walked four times in the 9th spot, stolen a base, and made an error in the same game. With his final turn in the rotation for July completed, we’ve now had almost exactly one full year of Sonny Gray – one year of the 24-year-old starting pitcher, the up-and-coming staff ace, the dueler of Playoff Verlanders. In that year, we’ve seen him do some great things, like going eight innings with nine Ks and no runs against the Tigers in Game 2 of the 2013 ALDS. We’ve also seen MLB Fan Cave forcing him to prank New Yorkers as a result of some unknown fine print embedded in his rookie contract. Above all else, the one thing we’ve always known is that Sonny Gray has a really good curveball. Let’s examine some changes he's made to it to increase its effectiveness. When he’s not misplaying balls in the outfield to bait runners into trying for an additional base so he can throw them out, Yoenis Cespedes is an enigma at the plate. We sometimes see flashes of the player in the awesome showcase video, but we most often see a player with plate discipline issues who struggles with consistent production. After almost two and a half full seasons (not counting injuries), some strange trends have surfaced in the progression of Yoenis Cespedes as a hitter. With almost three months of baseball to draw from this year, let's look into some of the "adjustments" Cespedes has made this year. After watching Donaldson's at-bats against Masahiro Tanaka, I started wondering how he fares against other elite pitchers in the game, having an unproven hunch he might struggle against them. We know that most everyone struggles against elite pitching, as that is generally the very definition of elite pitching; however, there's the larger question of just how much impact elite pitching has on hitting statistics, and how elite hitters fare against elite pitching. One might assume that elite hitters are better able to succeed against elite pitching. Looking at Donaldson's statistics, you wouldn't think that is the case. Men's tennis isn't a graduated spectrum of ability; it is an exponential one. There are men who ride the currents of technique and skill to a top 50 or even a top 20 rank, and then there are the brilliant storm clouds of exceptional talent and athleticism that roil above them, entrenched with infighting. After Stan Wawrinka's Australian Open victory, where does he fit in this paradigm? There is, I believe, a commonly held but largely subconscious concept that sportsmanship resides in a liminal space between civilization (the outside world) and barbarism (the playing field). For almost all sports, this is a no-brainer: you play hard, you play to win the game, but afterwards you shake the hand of the man on the other team and act within the civil bounds society has laid out. That's good sportsmanship; that's class. We applaud guys that "play the game the right way", and we vilify those that don't, even if they are exceptionally talented and at the top of their field. Richard Sherman is one of those villains, and most people hate him for it. A small minority love him for it.